In a city known for its rich beach culture and world-renowned surfing, Orange County’s Huntington Beach, CA is also home to Regency Centers Newland Center. Built in the late '80s, the shopping center recently underwent a façade remodel reflective of its seaside community. The intent was to capture the essence and authenticity of the coastal lifestyle. 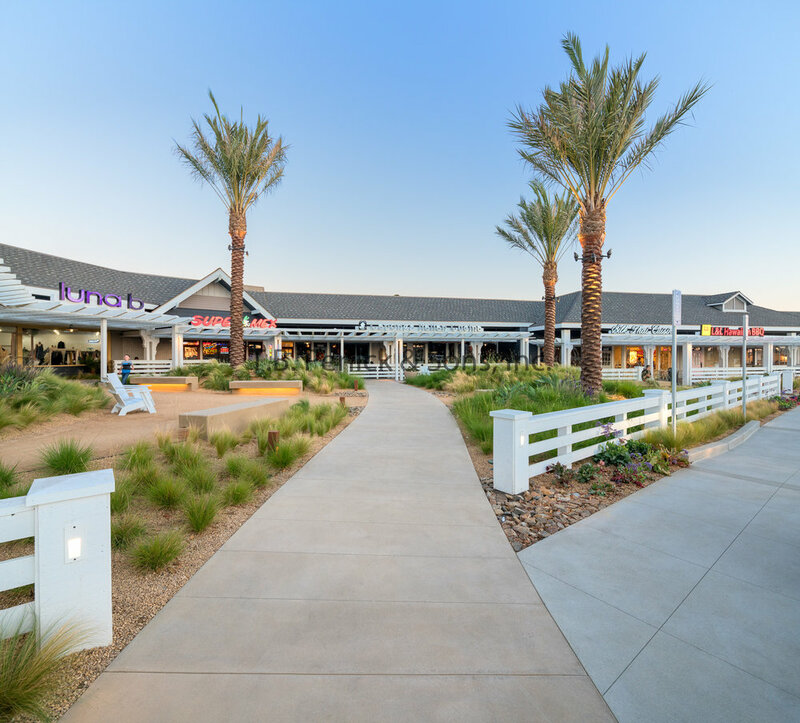 Located on Beach Boulevard, the town’s primary north-south connection with highly trafficked I-405, the 149,140-square-foot shopping center is a grocery, dining, and health and wellness go-to for the community and its seasonal visitors. 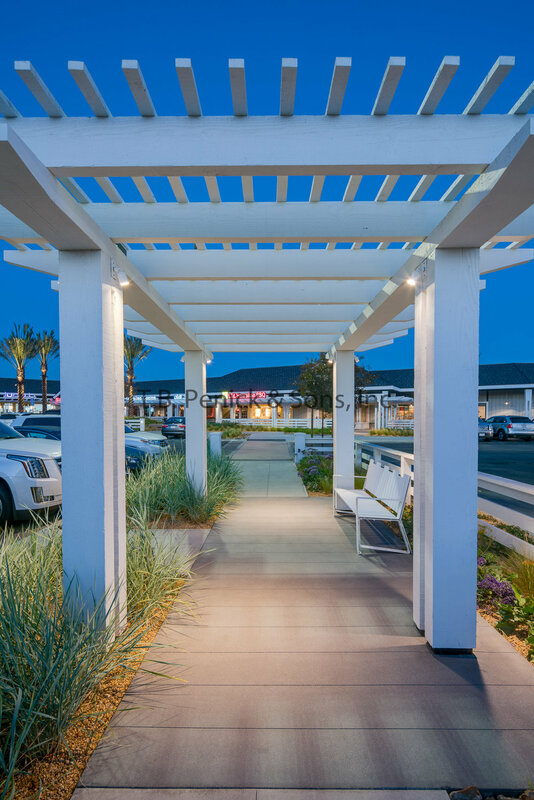 To enhance the communities shopping experience, Regency transformed an underutilized courtyard into an inviting boardwalk-style walkway complete with benches, comfortable high-back Adirondack chairs and beach-inspired landscaping that includes feather grass and plants surrounded by granite pebbles. White trellises extend along the courtyard’s path, encouraging shoppers to connect with a variety of shops and restaurants throughout the center. T.B. 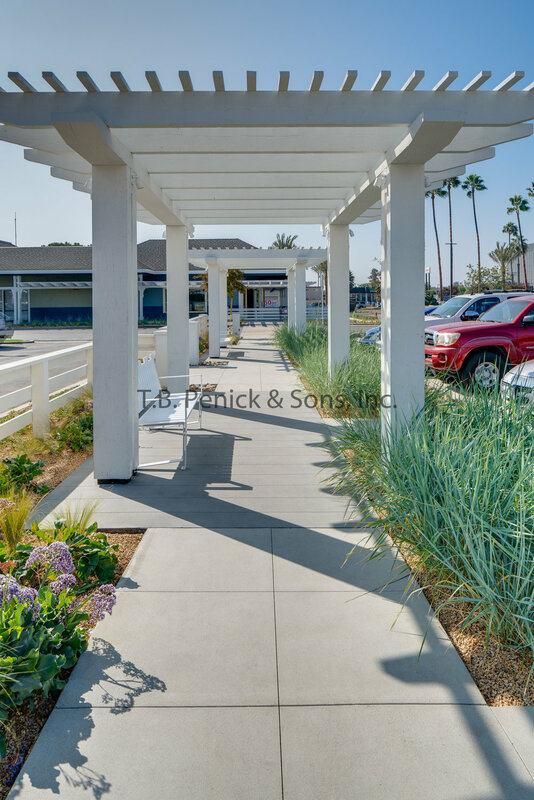 Penick helped capture the essence of the beach by installing integrally colored quarried stone finish concrete in lieu of the board plank stamped concrete that was originally specified. The architect felt that quarried stone finish was a more current take on their design intent and felt that it was a more beach appropriate look. Decorative saw-cuts were utilized to preserve the look of the board plank pattern. T.B. Penick also installed the Led-lit cast-in-place cantilevered seat benches and incorporated the same quarried stone finish.